Welcome to RyG's Cruise Guide's Printable Cruise Resource Templates! All of our cruise related printable forms are currently able to be printed or downloaded from Google Drive. You do not need a Google login to view, print, or download any of these. Enjoy and have a great day! 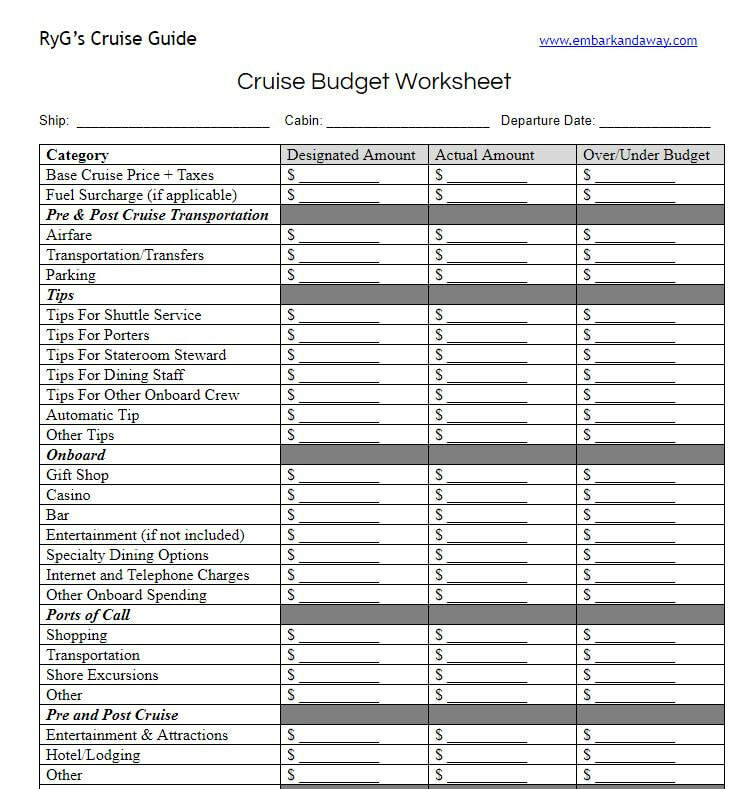 This cruise budget worksheet contains several generic categories that are common to many cruise lines. The first category of the budget allows a cruiser to pre-plan and determine how much they want to spend on each aspect of their cruise vacation. 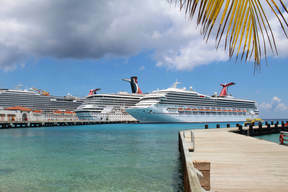 The next category is for post-cruise analysis and determining how much was spent during the cruise. A cruiser can then calculate if more or less money was spent on each category of the cruise vacation in the budget's third column. This is great for almost any cruise vacation and for cruisers who want to try to watch his or her money. Remember a budget is only good if you actually try to follow your spending goals! This cruise packing list was created to help cruisers determine what items need to be packed prior to a cruise as well as provide a place to mark which items have been packed. 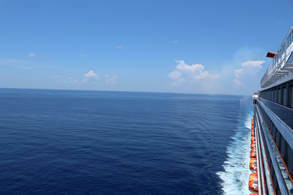 An additional column is available for each item to help cruisers that want to also mark off items as they are re-packed at the end of a cruise. A second component of this packing list template is for onboard purchases and purchases made in ports of call. During a cruise as you purchase things you will bring home consider writing them on here and then as you pack to leave your cruise mark them off! Do not forget to take what you buy home with you! Each day of the cruise will likely be different and keeping track of each thing you wish to do can be hard. 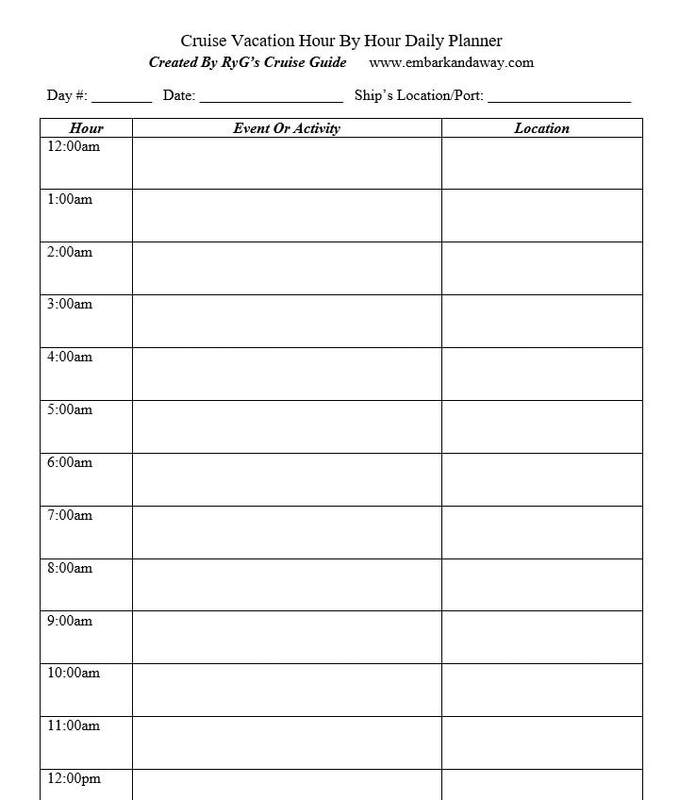 The goal of this planner is to help a cruiser keep track of each day (24-hour period) of his or her cruise. As you plan each day, both sea days and ports of call, write down the time of your event during the appropriate hour as well as the location of that event. Consider printing one of these for each day as it only covers a 24 hour time period. 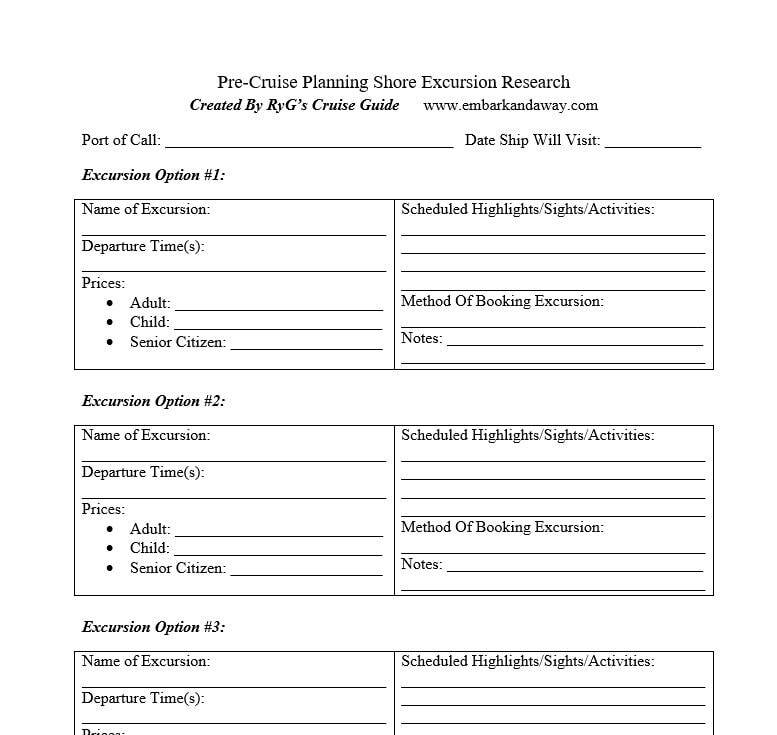 This pre-cruise shore excursion research worksheet is designed to allow you to write down details for up to three shore excursions you are looking into for a particular port of call. You can write details such as the excursion's departure time, prices, highlights, and other notes. If you do not know what excursion(s) you want for a particular place and are starting your port of call research, this might be a good worksheet for you to use to start logging your research!